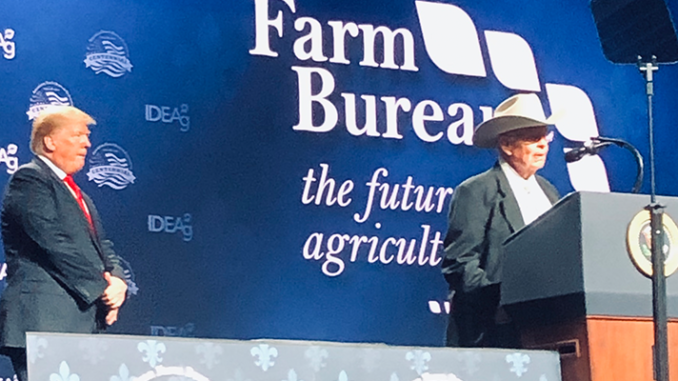 Arizona rancher Jim Chilton speaks at American Farm Bureau Federation Convention Monday, Jan. 14, at invitation of President Donald J. Trump. ARIVACA — When Jim Chilton received a phone call from the White House on Friday, requesting that he attend the American Farm Bureau convention in New Orleans the following Monday, he was not thrilled with the invitation. “No, I’m not going, it’s a long way away,” he told the White House aide, after returning a phone call from an unknown number with a Washington, D.C. area code. “President Trump is going to speak,” the aide told Chilton, 79, a cattle rancher from a pioneer Arizona family who is an outspoken advocate for border security. Chilton told her that he heard that the Trump rally held in Mesa attracted a huge crowd and he did not want to fly to New Orleans to be in a similar situation. “I’m just not going,” Chilton told her. He thanked her for calling and hung up the phone. But the following morning his curiosity was aroused. “Why is someone from the White House calling me?” he wondered. “OK, I’ll go,” said Chilton, who worked as an assistant for the powerful U.S. Senator Carl Hayden as a young man, and still vividly recalls a meeting with former President Lyndon B. Johnson which occurred in January, 1972. Sue Chilton, also known as Super-Sue, quickly made travel arrangements for her husband for the trip to Louisiana. He was told there was a seat with his name on it in the front row. A Trump aide told him that sometimes the president invites people onto the stage. “Maybe you should think about what to say if he calls on you,” the aide advised. Chilton was ushered into a room by a Secret Service agent. After a wait of about 30 minutes, the president entered. He reached out to shake his hand. “Mr. President, my name is Jim Chilton,” he said. “Oh, yes, you’re well known around Washington,” Trump said.